While last month was characterized by super-stress, this one has been characterized by super-fun! My prelim was on March 4 and I’ve been having a great time since then getting back to work. Kyle and I also both had additional presentations to give to various audiences this month, so our work has been more slide-making and reflecting on previous work than generating new data. We hosted a lot of social stuff this month, which was costly (but worth it, of course). There was March Madness, so we had friends over and went to a friend’s house to watch our school play. We also hosted a brunch for 11 people after church on Easter and provided most of the food – we even had to rearrange our furniture to seat the majority of the party! I traveled to the DC area for a bridal shower, and those costs came out of our Travel account. One purchase that is not showing up in this review is the cost of our flights to CA. Kyle’s grandfather passed away last week so on Wednesday April 3 we flew to CA for his funeral. We purchased our flights (about $1300) on March 31 using Kyle’s parents’ credit card. The choice to pay for the flights ourselves (which we could have done – thanks Travel Targeted Savings Account, Nest Egg Savings Account, and/or Emergency Fund!) or accept their generous offer to pay for them was ultimately Kyle’s call as they are his parents. We didn’t have time to debate for weeks over whether or not to accept that gift as we have in the past for offers from our parents. So that is what it is – perhaps we will discuss it further in a future post or perhaps not. I don’t want to seem ungrateful for their gift as it is quite nice to not be out that $1300 – maybe I’m just too proud. Our INCOME, SAVINGS, GIVING, rent, internet, and cell phone transactions are now stable! Well, we might have to keep fighting on our cell phone bill to lower it by $6, but we’ll see. We also allocated Kyle’s extra paycheck along the usual lines. Groceries: OK OK we are over again. But it’s not as bad as it looks! We actually spent $572.57 but I reimbursed us $50 from our Nest Egg for our Costco membership renewal fee, so that is where the $522.57 comes from. 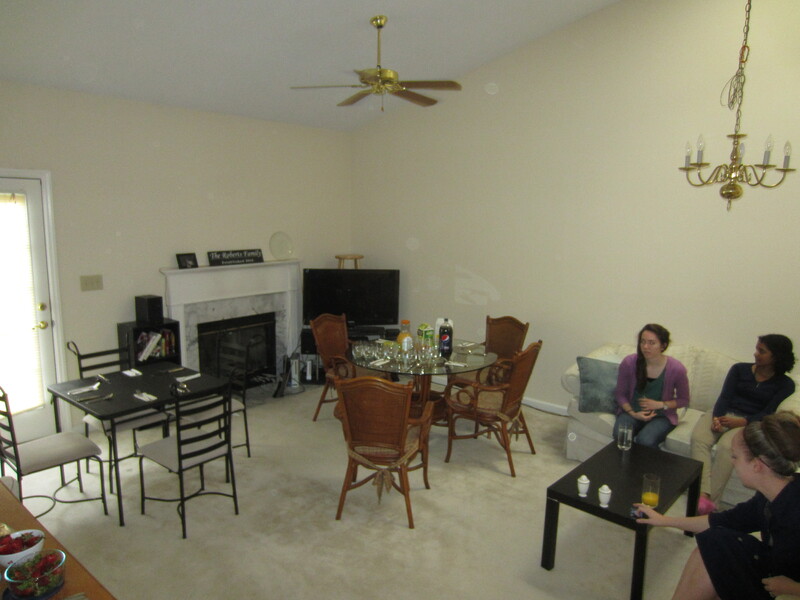 However, this month we had friends over for more than three occasions – for my post-prelim celebration, for watching basketball (2-3 times), and for brunch on Easter. We spent (more or less) $153.01 on food for these gatherings. Without having to buy that extra food we would have actually come in UNDER budget for the first time in many months (and this is after STOPPING our grocery challenge). I have ben considering opening up another targeted savings account for entertaining so that we can feel more free to invite friends over even when we are over-budget on groceries. Hospitality is very important to both me and Kyle and we would like to open our home to our friends more often. 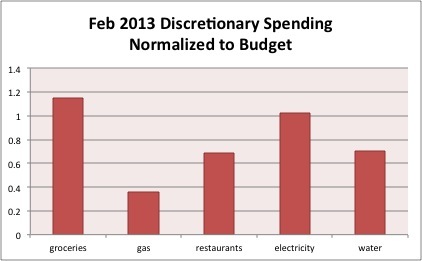 Gas: Under budget this month, despite filling up three times! Restaurants: We went out 3 times in the last week of March, all with friends, and still managed to come in under budget here thanks to one very inexpensive gathering (Kyle spent $8.91 and I brought my own food). Electricity and Gas: Oops, over in this category. Hopefully we are entering spring (still a bit questionable in NC) and we won’t have so much in heating/A/C costs for a while. Water: Under, though Kyle thinks we are being wasteful with water. We actually had NO transactions this month that didn’t fall into our normal budget or targeted savings areas! Crazy! This month we spent $1,011.42 out of our targeted savings accounts. We reimbursed ourselves $91.82 for a drive to Baltimore. We paid $587.60 for tickets to Boston for our friends’ wedding. We also added gift money to this account. I spent $107.00 on three items of clothing – yikes! We donated $175.00 to three causes this month – fire relief for a local apartment complex, a food bank, and a friend’s bike ride for MS.
We transferred $50 from our Electronics account into this account to repay ourselves for our upfront smartphone costs. We also used $50 for our Costco membership renewal. No adjustments this month, though I am mulling over the Hospitality targeted savings account. We went over budget this month! No tricks this time to squeak in under. We were over by $30.16, which I think is actually pretty good for having spent $150 on entertaining. I transferred this month from our nest egg back into checking to zero out. 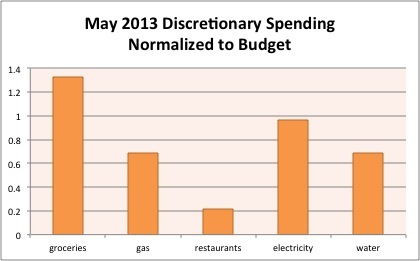 When was the last month you had no un-budgeted, unexpected spending? Do you beat yourself up when you go over your whole monthly budget? When you have had to travel at the last second, did you pay or did someone else? 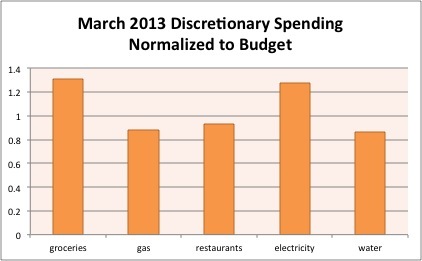 13 Responses to "March 2013 Month in Review: Money"
I don’t beat myself up if we’re over budget. In a sense, I think it’s good and humbling and keeps us on our toes when we go over in one category or another. I guess if you never went over in a category, you’ve probably set it too high! I didn’t mind too much this month because the reason was so clear and unusual. Sorry to hear about Kyle’s grandfather. I have been over budget the last few months due to the baby. I just can’t keep up with him. I am not sure if we will save money on our electricity bill because I am sure Raleigh is going to skip Spring and go right into summer. That would not be good, but this weekend will be super nice. The weather has been quite strange this spring but I am hoping for a spring! Where are the baby expenses coming from? My friends with kids have reported a negligible impact on their monthly budgets after the start up costs, but maybe they are just not paying close attention. I’m sorry about you and Kyle’s loss. Don’t feel bad about his parents paying the tickets – I think it’s a perfectly reasonable thing for them to offer and for you to accept under the circumstances. My grandfather is ill and the flight back home would cost at least $1,500. If my parents offered to pay, I would’ve taken their offer without blinking an eye. Thanks for saying that, Well Heeled. 🙂 We’re glad we were able to fly out to be with family during this time. Great job this month! It must be a fantastic feeling to go out as much as you did (and fill up on gas an extra time) and still come in under budget. I’m sorry to read about Kyle’s grandfather. Slightly over budget, actually… Only by $30 though so not too bad! I’m sorry to read about Kyle’s grandfather. But hey, you did good for the month of March. And oh yeah, I would have taken the tickets too if I were in your position. Thanks. :/ I still feel a bit weird about it but Kyle is at peace with taking their offer.